In 1972, the City of Petaluma in Sonoma County passed the first voter-approved growth control initiative in California, restricting new housing permits to no more than 500 dwellings per year. The 9th circuit Court of Appeals upheld the law. “Although we assume that some persons desirous of living in Petaluma will be excluded under the housing permit limitation and that, thus, the Plan may frustrate some legitimate regional housing needs, the Plan is not arbitrary or unreasonable.” (The court held that excluding people and harming regional housing goals was legal because the police powers of local zoning are broad and the city’s growth controls were rationally related to objectives like preserving the rural character of the town). A related policy tool that cities use to temporarily limit new development is the interim ordinance. Jurisdictions can pass 45 day bans on the issuance of new building permits or other approvals, and then extend the ban for approximately two years. Cities apply these interim measures when they are developing permanent rules or restrictions. 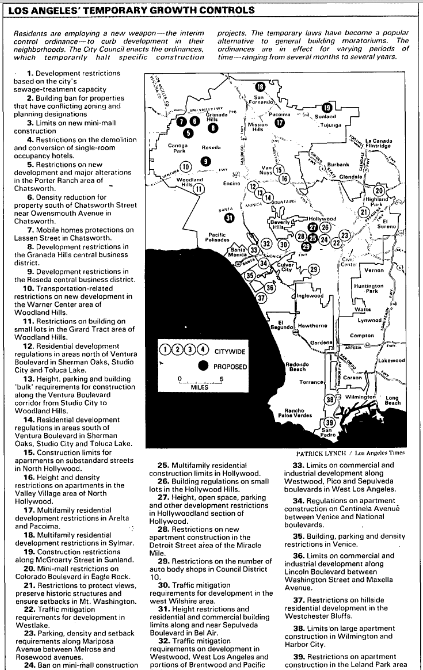 The map at the top of the post, for example, shows that when the City of Los Angeles was in the midst of a slow-growth political upheaval in the late 1980s, nearly 40 interim control measures were in effect covering different types of development in parts of the city. 1. Require specific findings on an adverse impact on public health and safety for permanent growth controls impacting multi-family housing. If you follow housing issues in California, you may have read about (or testified on!) the proposal to build 4400 homes in the Baylands site close to San Francisco. Most of these homes will probably never be constructed, because the area is part of a small town named Brisbane that is reluctant to allow a large residential development. Even in the midst of a housing crisis,boundaries matter, because cities or counties (in the case of unincorporated land) control what homes are allowed where. Some cities were formed to favor non residential uses, or to ‘protect’ low-density residences. Vernon and City of Industry are examples of industrial-zoned cities. One of my favorite examples of anti-housing cities was Dairy Valley, incorporated in 1956 to protect feedlots and dairies (and renamed Cerritos in 1964 after cow-protecting zoning was abandoned). Mike Davis wrote about the incorporation of exclusive suburbs in City of Quartz. 1. Give LAFCOs a mandate to help meet regional housing needs. 2. Give LaFCOs power to adjust city boundaries (without requiring elections) if cities are resisting adding housing in appropriate locations. (For example, transfer the Baylands Site from Brisbane to San Francisco if San Francisco pledges to allow housing there). Expanding the powers of LAFCOs raise the same issues mentioned in the first installment of this series regarding regional planning: what entities are suited to make regional decisions, and who do they represent?